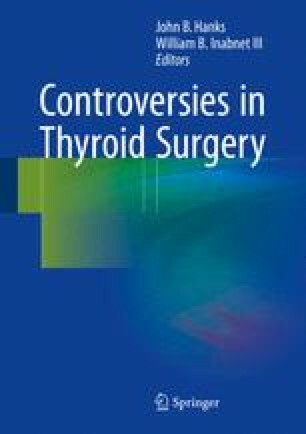 The Role of Targeted Therapies or Nonsurgical Treatment of Thyroid Malignancies: Is Surgery Being Replaced? Targeted therapies are emerging rapidly and are challenging the traditional roles of nonsurgical therapy for the treatment of thyroid cancers. Molecular pathways hold the key for designing rationally based drugs such as the already FDA-approved tyrosine kinase inhibitors: sorafenib, vandetanib, and cabozantinib. Many more targeted therapies are under investigation. For instance, selumetinib is a MEK inhibitor that has been shown to restore radioiodine avidity to radioiodine refractory thyroid cancers. This chapter reviews standard nonsurgical treatments including the historical use of cytotoxic chemotherapy, the molecular science behind newly approved and experimental targeted agents, and their supporting clinical trial data. Lastly, the chapter presents four common scenarios in thyroid cancer management where an increased role is forthcoming for nonsurgical modalities such as tyrosine kinase inhibitors. These cases contrast the cutting edge use of pharmacology, as monotherapy or in combination, with the current held standard of care. Nonsurgical modalities for thyroid cancer care are rapidly advancing, and the best use of these modalities has yet to be established as highlighted in the cases. UpToDate. Vandetanib Patient Information 2014; http://eresources.library.mssm.edu:2226/contents/vandetanib-drug-information?source=search_result&search=vandetanib&selectedTitle=1%7E21#F12746025. Accessed September 30th, 2014, 2014.